Kelle Roos had a trial at Birmingham City at the start of the season 2013-14. He did not get a contract and moved to amateur side RKSV Nuenen. In November 2013 Roos joined Conference Premier side Nuneaton Town and signed a contract until the end of the season. On 23 January 2014, Roos moved to Championship side Derby County. He signed a two-and-a-half year contract for an undisclosed fee. Roos made his professional debut for The Rams on 23 September 2014 in a Football League Cup game at home to Reading. On 15 July 2015 it was confirmed that Roos would join Rotherham United on a season-long loan deal. Roos returned to Derby County in September 2015 after being six weeks on loan, leaving Roterham United bottom of the table in the Championship. 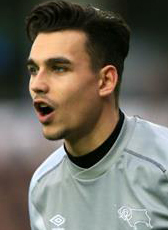 On 1 February 2016 it was confirmed that Roos has joined AFC Wimbledon on loan for the rest of the season. At the start of the 2016-2017 season Roos signed for League One club Bristol Rovers on a season-long loan deal. In January 2017 his loan contract was terminated and he returned to Derby. From half September to half October 2017 he was on a month loan at Port Vale.